Belgo is, to the best of my knowledge, the first Belgian restaurant to open its doors in Nottingham. What does that entail you might ask? Well mussels are what they seem to be most known for. A number of different chicken options are the other main item and where would we be without the ubiquitous burger of course. There are a handful of these establishments in London, this being the first one outside of the capital. It has replaced La Tasca’s premises (and is part of their parent group) opposite the Nottingham Contemporary, near Piccolino. The décor sadly didn’t contain any Tintin or Poirot references, in fact it wasn’t very memorable at all. It seems as though their PR team has been successful, every time I have walked past it’s been a full restaurant. Belgian beer is also a ‘thing’ and whilst it isn’t my favourite there is a good selection here. Starters were deemed not exciting enough to consider, a selection of; calamari, pate, chicken wings was all quite standard stuff. I also wanted to get to the mussels quickly after my disappointing recent experience at The Lobster Pot. There are lots of flavours here that stretch to the exotic spicy Korean kimchi. 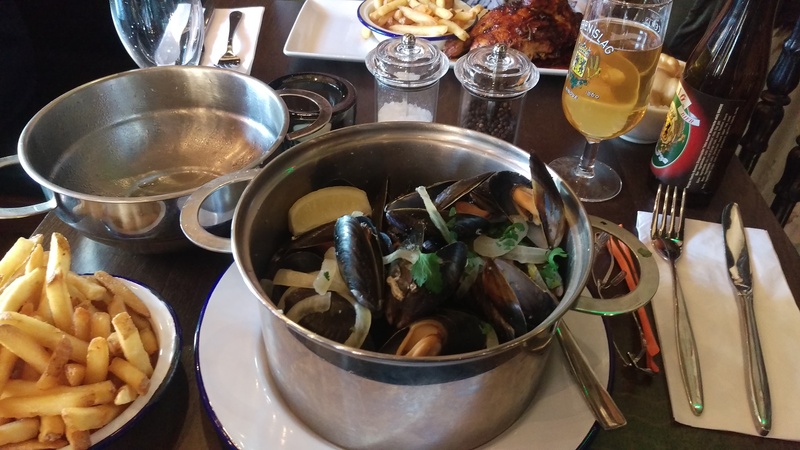 The traditional moules marinière I thought was the way to go for a fair comparison, come in at £13.50 including fries. They were getting there, the white wine, garlic and cream sauce pretty flavourful but still not the rich taste of the best examples I have had. There were chunks of onion that were too big, crunchy and distracting. The Belgian frites were excellent, probably one of the best chips in Nottingham. 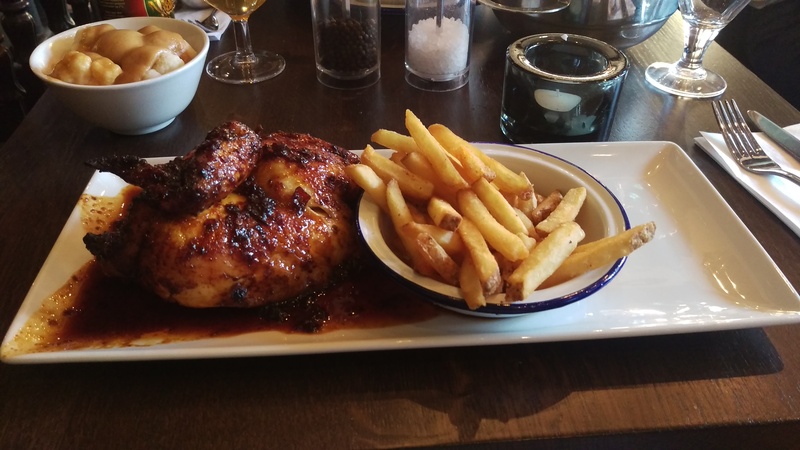 I also tried their rotisserie chicken, a chilli one with ginger and lime leaf. Good spicing and good flavours, often chicken cooked in this way can often be quite bland, but not here. A side of cauliflower cheese had also caught the eye, which it certainly did when it arrived as I thought it had been doused in toffee. It turned out that it was just an ugly brown cheese they had used to cover the overcooked and under seasoned vegetable. One of the worst things I have eaten in a while. Dessert options are dominated by a build your own waffle or crêpe. I plumped for the later, and plump is the right choice of words. You choose a sauce and ice cream, chocolate and salted caramel for me. You know what you are getting here, the accompaniments were of ok quality but it was a little bit basic. Had I not had the mussels at Belgo I think I would have actually been happy, sadly that is the item they stake their name on. Better that than their cauliflower at least. It is a difficult one to rate, from the chips (9/10) to the cauliflower (3) and everything in between. Sadly I will settle for a boring 7 overall. It was reasonable value for the mussels, which aren’t ever a value item and service was functional but certainly not good. 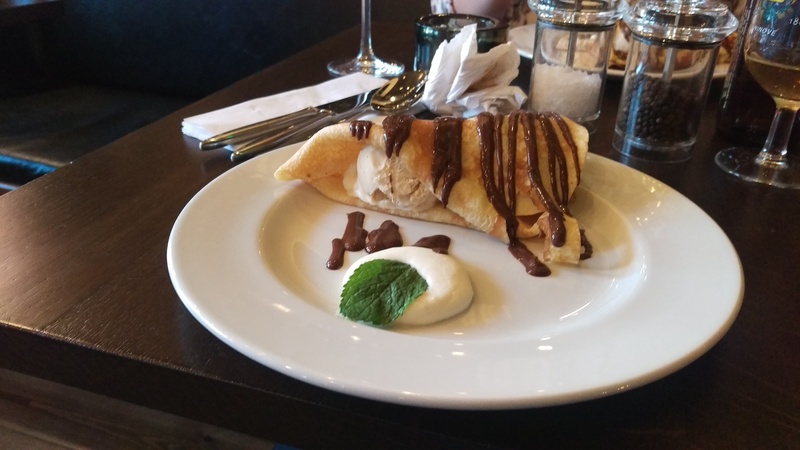 Despite some enjoyable food I just can’t think why I would want to go back to Belgo. If I do want some seafood Loch Fyne is really unrivalled in Nottingham, I suppose if you must have a Leffe, some molluscs and a waffle then this is the place to go.